Where are the graves of the Pioneers? They all lie far away in bush and plain. By a lettered tree or an unhewn stone. Whilst some will be sought in vain. The early years of the Casterton Old Cemetery from the founding of the town by Alex McKINLEY in 1846 until the signing of a public petition on September 1st 1867 are shrouded in mystery. The earliest recorded burial, bearing a head stone is that of Geroge WYMAN who died on 13th February, 1858, only 22 years old. The earliest recorded minutes of the Trustees of the Casterton Old Cemetery are those following a disasterous fire which took place at BOND and CLANCY's General Providers stores on 25th May 1896, in which all the early known records of burials, maps and the register were lost in the fire for posterity. In addition to the register of burials there is little doubt that many of Casterton's earliest citizens are buried on the old cemetery in unmarked graves. Some were too poor to even afford a decent burial and are buried in pauper's graves. The remains of the murdered HUNTs, the victims of the fiend George WAINES are reputed to be buried in the old cemetery. Despite exhaustive enquiries to the Health Commission of Victoria, very little information is available until a public petition was handed to the Shire of Glenelg on September 1st, requesting that a site for a new cemetery be set aside. The Casterton Old Cemetery was officially gazetted on 6th June 1879, but strange to relate the Casterton New Cemetery was gazetted on 11th February, 1868. 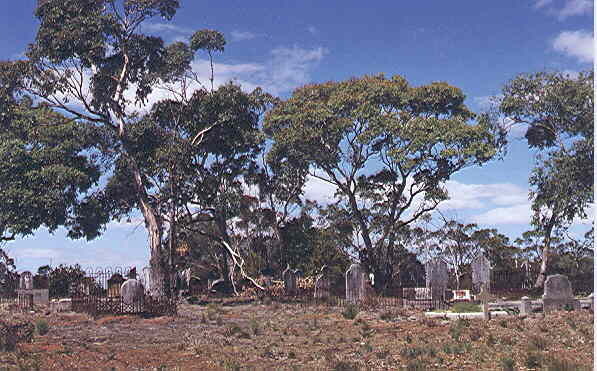 The Merino Cemetery in the Parish of Mocamboro is probably the oldest official cemetery in the Glenelg Shire, as it was gazetted as a cemetery on 21st June, 1864. Some of our earliest pioneers, the settlers who took up the big station runs are buried in the Old Cemetery. George ROBERTSON of "Warrock" and his wife Mary are buried there. So to is John ROBERTSON of "Struan". George CARMICHAEL, one of the earliest owners of "Retreat" is also there. So too is George CHAFFEY and his wife Phillipa, early owners of the Glenelg Inn. John CARRUTHERS, one of the Shire's earliest Shire Engineers, who died a young man of only 43 years of age on April 10th, 1875. So too is Elijah HANDLEY, after whom one of our streets is named, was buried there on 14th November, 1860. 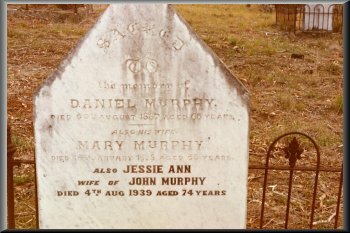 William McPHERSON of "Nangeela", who survived the 'Black Thursday' bush fires of February 6th, 1851, and the 'Big Floods' of 1853, is buried in the Old Cemetery with his family. An infant daughter, Marie Josephine, was first buried in the "Dunrobin" Station garden. After they purchased "Nangeela" Station in 1857, Marie Josephine's remains were exhumed from "Dunrobin" Station and reburied in the Old Cemetery in 1856. NOTE: Reference to the first burial in the Old Cemetery of a shepherd found by Mr. SILVESTER in a report of Samuel BULL's golden wedding celebrations in 1905. The burial was by Mr KIRBY and Samuel BULL. A SMALL but enthusiastic band of volunteers, headed by Lyn Tait, have for the past five years or so, been doing their bit to restore Casterton's Old Cemetery. And while it is hard yakka, the group never complains nor asks any favours, simply preferring to get on with the job at hand. Some of the volunteers met at the cemetery on Thursday with Glenelg Shire chief executive officer, Jennifer Todd and Councillor Karen Stephens, for the 'unveiling' of a new sign, kindly donated by the Apex Club of Casterton. Also on hand and representing the club was Shane Gill. The new sign is located on the Mount Gambier Road side of the Cemetery. Councillor Stephens said it is fantastic what Mrs Tait and her team of helpers is doing at the cemetery. "It's overwhelming what they have done so far," she said. "There is a wealth of information in the cemetery, and along with what the group has already sourced, this provides a valuable record for people seeking to trace their family trees." The Casterton Old Cemetery holds an estimated 640 graves, and while official records no longer exist, having been destroyed in a fire at the town hall many years ago, it is known that the earliest grave dates back to 1858. Mrs Tait said existing records list 250 surnames, but she cannot say for certain how many people are buried at the cemetery. Many of the graves are simply "mounds in the earth", and volunteers are currently digging around them, in an effort to isolate individual grave sites. Of the identified graves, many have suffered extensive damage over the years, and this is another aspect volunteers are working on. Mrs Tait said, with the assistance of Glenelg Services staff, it hoped to right damaged headstones and place metal rods in the middle to support them. In the meantime work will continue on ground works. With much of the area just a 'blank', the group is appealing to the local community to help identify graves or sections of the cemetery. They are asking people who may have ancestors buried there, and are aware of their location, to contact them. "This will make our job a little easier when it comes to compiling an up-to-date catalogue of the graves," Mrs Tait said. She is also appealing to anyone who may have a heritage style steel gate "hidden away" and would like to donate it to the cemetery. "Our old gate was "taken" about 15 years ago and we would like to get hold of another one to allow us to complete fencing around the cemetery," she said. "The donee can have their name attached to the gate if they wish." While the group receives very little financial support to help with their efforts, sometimes the unexpected happens. Such was the case earlier this year. Mrs Tait said a group were at the cemetery when a gentleman in a South Australian registered car pulled up. She said he made some enquiries about a listing of names and what help they get to maintain the cemetery, before wandering off to have a look around. "We thought nothing more about it," she said. "Later we discovered he had left a very generous donation attached to the clipboard." But situations like this don't occur everyday, thus leaving a handful of keen locals manage the best way they can, to restore a significant part of Casterton's early history. Mrs Tait said the group does receive valuable assistance from the Glenelg Shire's Resource officer, Dayle Walters. "He has been just marvelous," she said, and "the shire has also been a big help." While the group is happy just doing what they do, they did let slip that any assistance would always be appreciated. As mentioned earlier, what they really need in the short term is a gate and community help to identify graves. This will allow the group to not only complete perimeter works, but assist in correctly documenting the site for current and future generations. If anyone can assist, Mrs Tait can be contacted on 5581 1251. This article has been reproduced with the permission of "The Casterton News"